He said today: “The killings in London and Virginia highlight the growing threat of far-right violence in the West. While the media obsessed last week over Bernie Sanders’ responsibility in the shooting of a Congressman, there have been no fewer than five murders linked to white supremacist and alt-right supporters since Donald Trump was elected. We see a pattern with these attacks. 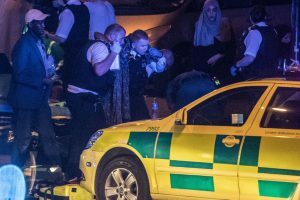 Government officials and news outlets are swift to label an attack carried out by a Muslim as terrorism, but they are slow to label attacks perpetrated by far-right extremists as terrorism, as shown by the London attack. In other instances, the attack is never called terrorism. That is the case of Jeremy Christian, the Portland-area man who allegedly knifed two men to death after they came to the aid of two women of color, one wearing a hijab, as Christian threatened and assaulted them. He was a known white supremacist and had been filmed at an alt-right rally weeks earlier throwing Nazi salutes and yelling, ‘Die Muslims,’ but that is apparently not enough evidence for the two murders to be investigated as or deemed a possible terror attack. “While the victims of terrorism are spread across the population … it is Muslim communities that bear the brunt of terrorism, particularly in countries destabilized, bombed, or invaded by Western forces.